Refshaleøen is an island in the harbour of Copenhagen, which was mainly used as a shipyard from 1872 to 1996. The island is going through a rapid change and today it appears as an icon in the Danish history of industry. The island houses a lot of different workplaces, galleries, beach bars and restaurants. Refshaleøen has a very central placement and is easily accessible. It only takes around 15 minutes to reach the versatile island from central Copenhagen by bike. 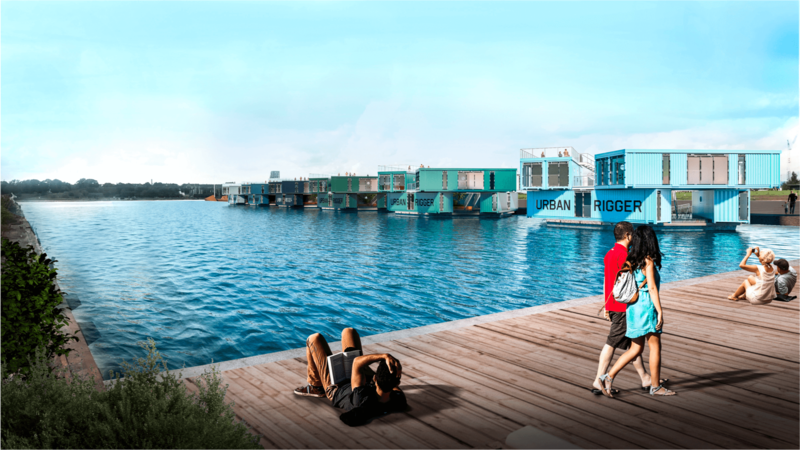 The municipality of Copenhagen has given the green light for the URBAN RIGGER project to create a floating mini-university city with 72 apartments in the harbour of Copenhagen. The first URBAN RIGGER has 12 apartments and happy students are living onboard today. The next 5 URBAN RIGGERs are expected to be ready by late summer of 2019, and ready for new students to move in. If you wish to become a co-owner of an URBAN RIGGER, please read more about the project and download the sales project here, contact us on our Contact site.